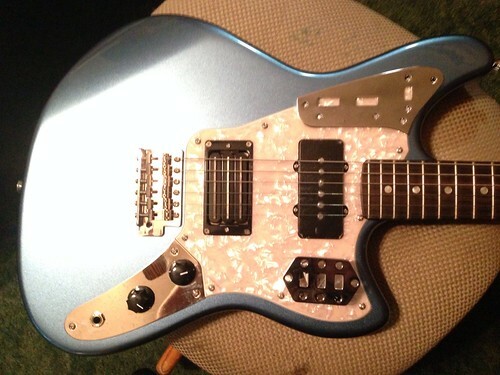 Just bought me a new Starcaster neck and I redid my original mockup of the modded marauder and came up with this pretty thing! Just need to get a black marauder or paint my blue one. What do you guys think? This should be a sweet build! prolly would be too much work but I'd try a different trem instead of that strat trem. mustang trem would prolly look nice. something about that body seems off too... maybe the headstocks making me think that. I don't know. I think it looks killer. tribute to the old while keeping the new. I'm not gonna change the trem. I don't have problem with strat trems. I just keep the bar out of them. And in this case it actually looks really cool. Putting the upper horn plate on it improves the look so much. The coolest part is these mods will hide the original Pickguard area completely. I did a real mockup with my marauder and it works great. I'll post a picture later. That headstock looks ridiculously huge on that mockup. ..are you sure that's correct scale? Yeah it's the right scale. It just kinda looks big because the starcaster headstock is longer. What upper bout? I put the rhythm plate in the exact same location as where the old Pickguard was. I'm not gonna modify every single thing because then I would have to repaint it. I like doing modifications that fit with the guitar and still have a natural look to it. Bought a black marauder from guitar center. Marauder, starcaster neck, and control plates are on their way to cooterfinger! If yours looks that good when complete, I might do the exact same project. GOTDAMN. Not worth the effort imo. Especially if you don't wanna refin it. But it looks so much better. The strat trem would have to be filled in and the mustang tremolo would completely cover it up. I actually wouldn't have to refinish it. I think cooterfinger could handle it. We have seen the crazy things he has done. If you want it to look cool, just throw a bridge cover on it.